Hmmm, being clothed in strength and dignity…wow! Right?!? 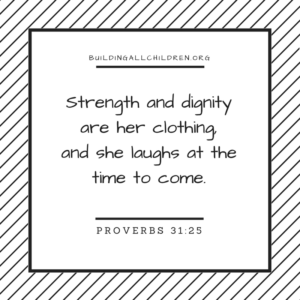 I want to be clothed in strength and dignity but the second part of the scripture that says “she laughs at the time to come.” The Lord desires us to laugh and enjoy our life! Laugh and enjoy our children! It was a beautiful reminder that we don’t always have to be stressed and serious! WE ARE CLOTHED IN STRENGTH AND DIGNITY! AND WE ARE TO LAUGH AT THE TIME TO COME! My challenge this Spring Break is to know that I am clothed in strength and dignity and I am looking forward to the times to come that I can laugh and enjoy my family!